Raleigh gave us a huge surprise with its amazing variety of places to eat. We definitely underestimated it going in; who knew our favorite place would be a Dim Sum restaurant/brewery/flower shop, and that a local bakery mills its own flour to make some of the best croissants in the United States. North Carolina’s Raleigh-Durham airport is located between three cities which form the “Research Triangle,” home to North Carolina State University, Duke University, and University of North Carolina at Chapel Hill. It makes it easy to visit Raleigh, Durham, or Chapel Hill, but we chose to focus on checking out Raleigh this time. They seem to be having a moment now. There are so many dining options in the city, but these were some of our favorites we’d recommend visiting. Boulted Bread – Stop here for coffee and a flaky pastry to start the day, or pick up a loaf of bread to bring home for dinner. 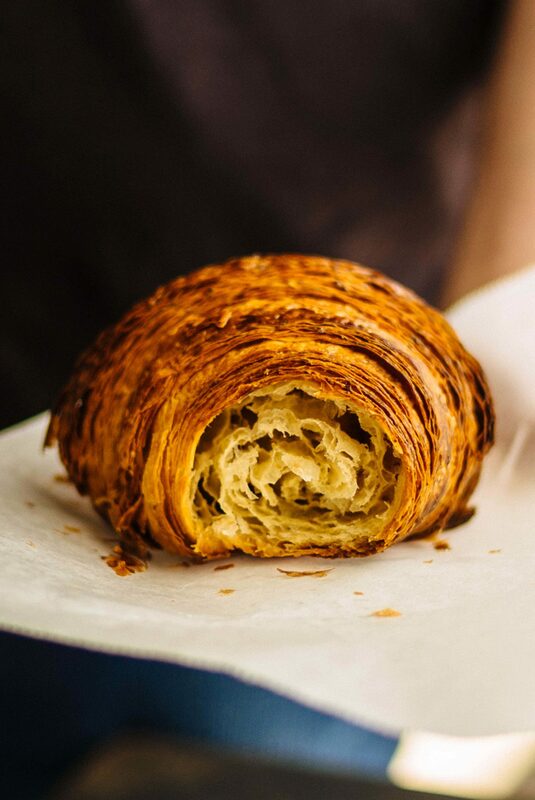 These guys are milling their own flour and making some of the best croissants we’ve had in the United States! We visited around Thanksgiving, and their pies looked amazing! Beasley’s Chicken + Honey – We tried to go here for brunch, but the line was way too long, so make sure you get there earlier unless you want to wait. No reservations. 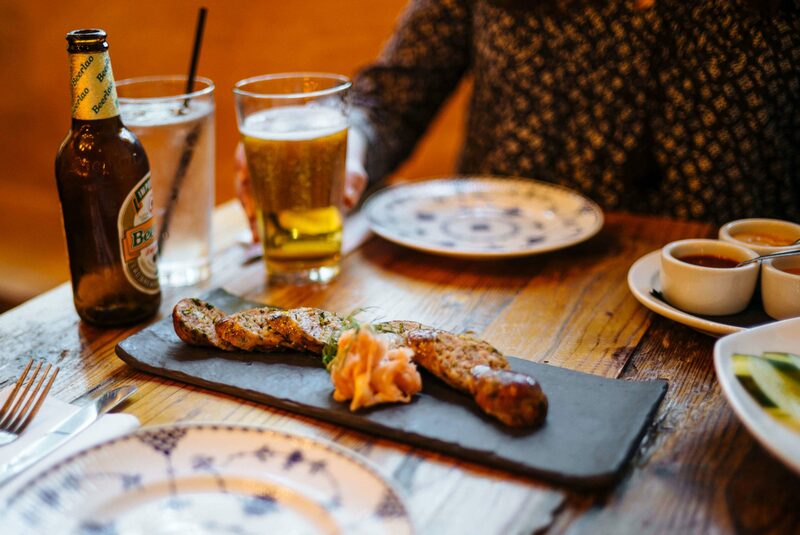 Brewery Bhava – Sip on pints of beer and order a spread of dim sum to snack on. See more of our recommendations on what to order here. (this was our favorite restaurant for lunch or dinner in Raleigh). 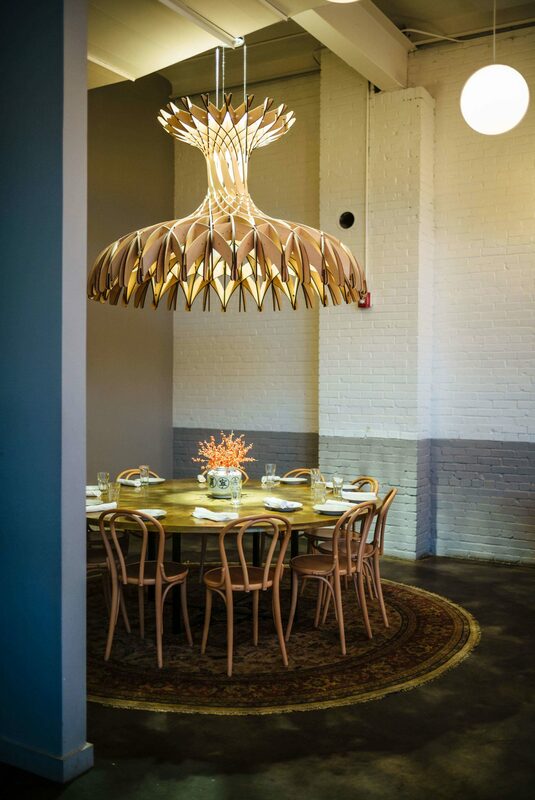 Bida Manda – Head next door for a Laotian family-style lunch or dinner. Start with the wings and lemongrass sausage, and finish with their pork belly ramen. This causal spot had some of the most amazing food we’ve found in an Asian restaurant recently! So much flavor. Videri Chocolate – This bean-to-bar chocolate factory gives you the chance to sample their hot chocolate and see how chocolate is made. Stanbury – This is an old-school Raleigh restaurant that’s perfect for a quiet, rustic evening. The restaurant specializes in seasonal dishes served in large portions. Reservations can be difficult, so we’d recommend ordering a cocktail while you wait for your table, or sit at the bar. Foundation bar – Interesting fact: under antiquated laws, bars in Raleigh are required to be “private social clubs.” You can typically get in to Foundation without any trouble early in the evening, otherwise you’ll have to have a membership, which you can purchase at the door for a nominal fee. This craft cocktail bar serves delicious cocktails made from American spirits.